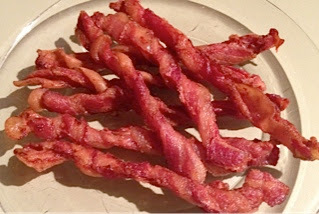 Many Paleo followers LOVE bacon but they are not that crazy about cooking, so when I found this idea online at thewickednoodle.com I knew it would be perfect to share. Their version includes a chipotle and sugar topping, but personally I don't think you need to add anything to bacon. It's already about as perfect a food as you can find. 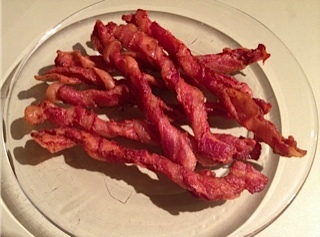 Bacon is the perfect snack, and this is the perfect "recipe" for people who hate to cook. I mean really ... how much simpler can it be? 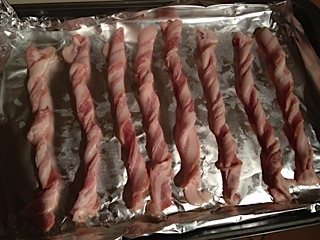 All you do is line a cookie sheet with foil (for easy cleanup), then take slices of bacon and twist them, line them up on the cookie sheet, and cook them in a 425'F oven for 10 to 15 minutes. You don't have to turn them or anything, just let them cook. When you start to smell the bacon, start checking to see if it's done. If not, give it another 5 minutes then check again until the bacon twists are as crispy as you like them. Put the cooked bacon twists on some paper towel to drain the excess fat, and let them cool a couple of minutes until they are cool enough to pick up. As they cool they will harden and become the perfect finger food. I think these are best when made fresh, but many people enjoy them just as much cold. Having a plate full of these in your fridge will allow you to indulge whenever the mood strikes. 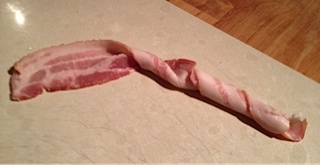 For some reason, twisting the bacon allows it to really crisp up nicely with no uncooked fatty bits. Fast, easy, and delicious - Bacon twists are the perfect reward for those who are making the healthy change to a Paleo lifestyle.